Waves of fabulous colour in your garden. Low growing, and ideal for filling those awkward spots most gardens have. Hundreds of small flowers through summer and autumn. Easy to grow, low maintenance and good disease resistance. Supplied as bare-root plants two of each Pink, Red and White. 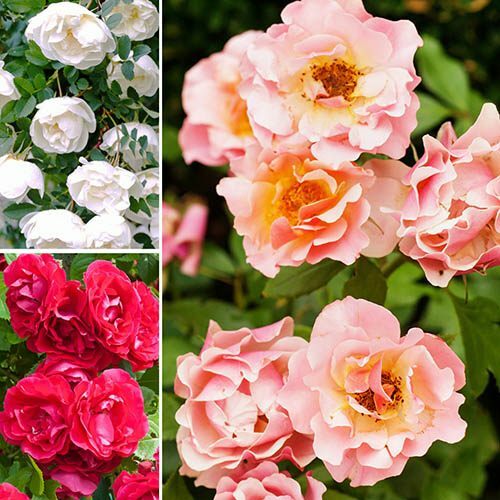 This beautiful mix of easy-care ground-cover roses are simply the best value low-growing roses to fill your garden with colour! A gorgeous mixture of three different shades they're extremely popular for the wave upon wave of flowers they produce, along with their compact growth and high disease resistance. These roses are ideal for borders or patio pots and are low growing, each covering an area 3ft x 3ft (90cm x 90cm) in 2 years, yet only grow up to 2ft (60cm) high, maximum. Each bush produces masses of gorgeous blooms, and well-established plants can produce thousands of flowers each season! You’ll get three beautiful colours – pink, red and white – for incredibly colourful, spectacular displays - supplied as bare-root plants two of each Pink, Red and White. Supplied as 6 x bare root roses, 2 each of 3 colours.